I‘m playing paper today to chase the clouds away. 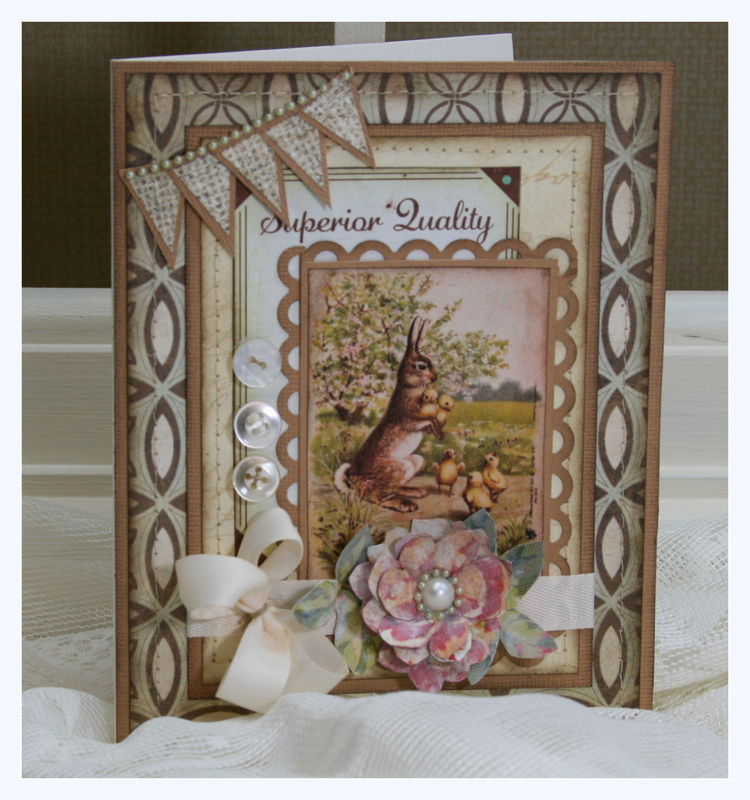 Hoping for Spring to get here soon I’ve created two brighter and cheerier cards. 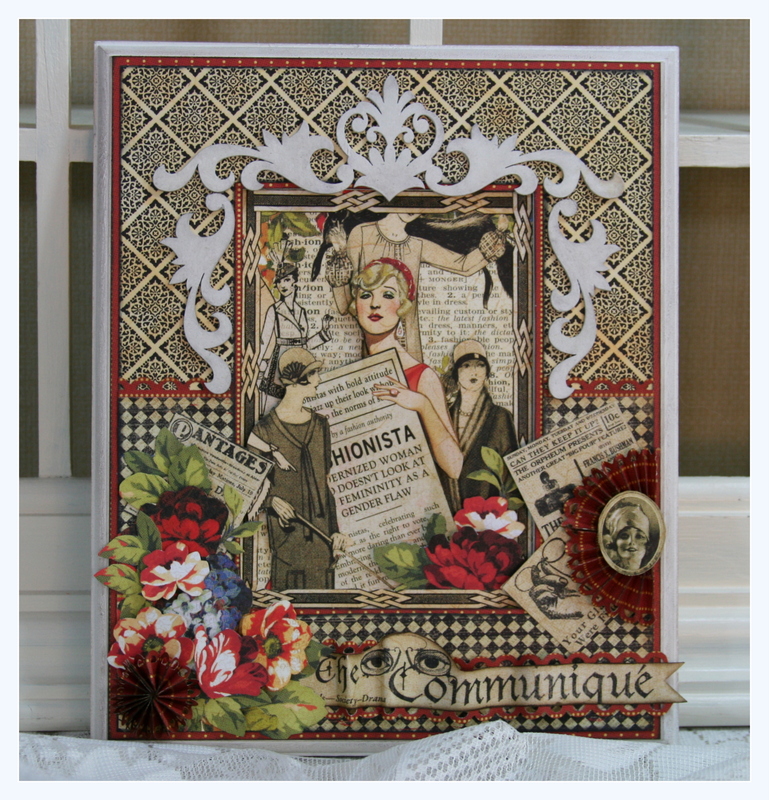 I selected a nice stripe from my Graphic 45 scrap and salvage box and layered on a lovely vintage image from Graphics Fairy. 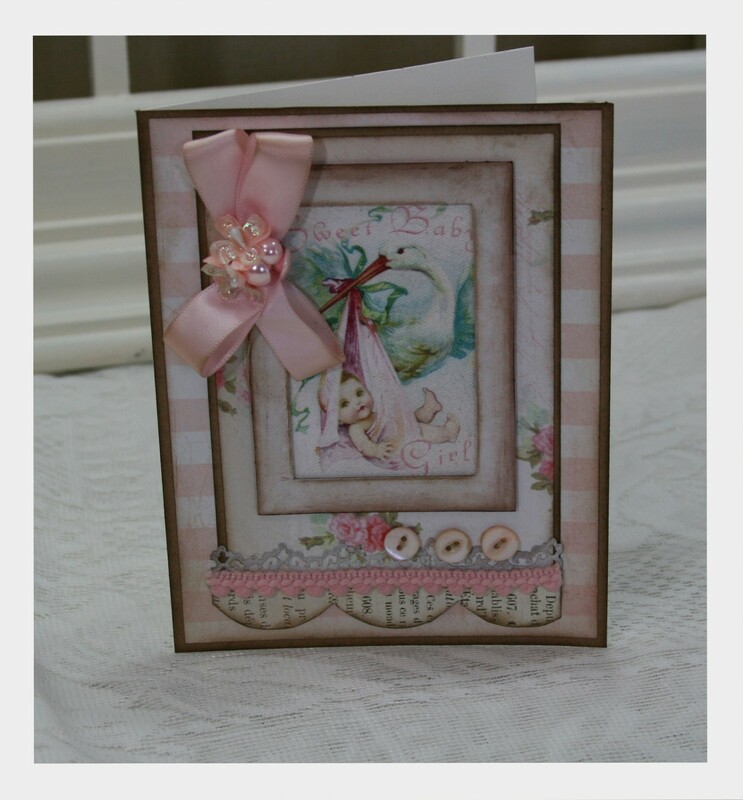 Marie Antoinette is so beautiful : ) I gave this card a nice craft paper border to anchor the light colors. 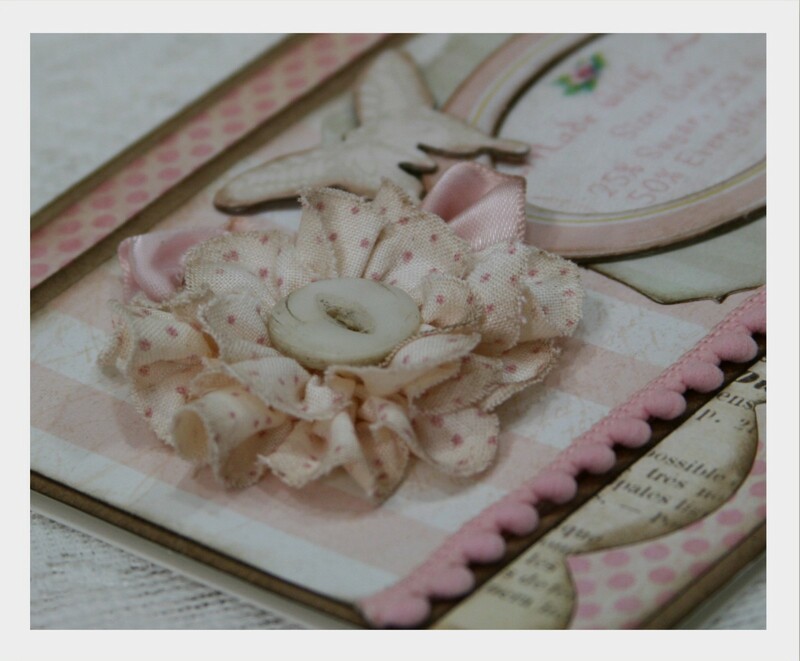 I punched and gathered a border and added individually cut out tiny flowers from the Graphic 45 scrap box. To the center of each flower I added a dab of Liquid Pearls. I also inked it well using Distress Inks. I really love this darling image from Graphics Fairy of the bunny and chicks. Don’t ya just want to climb right into that picture and hear them little chicks peeping and smell the blooms from the tree in the background. 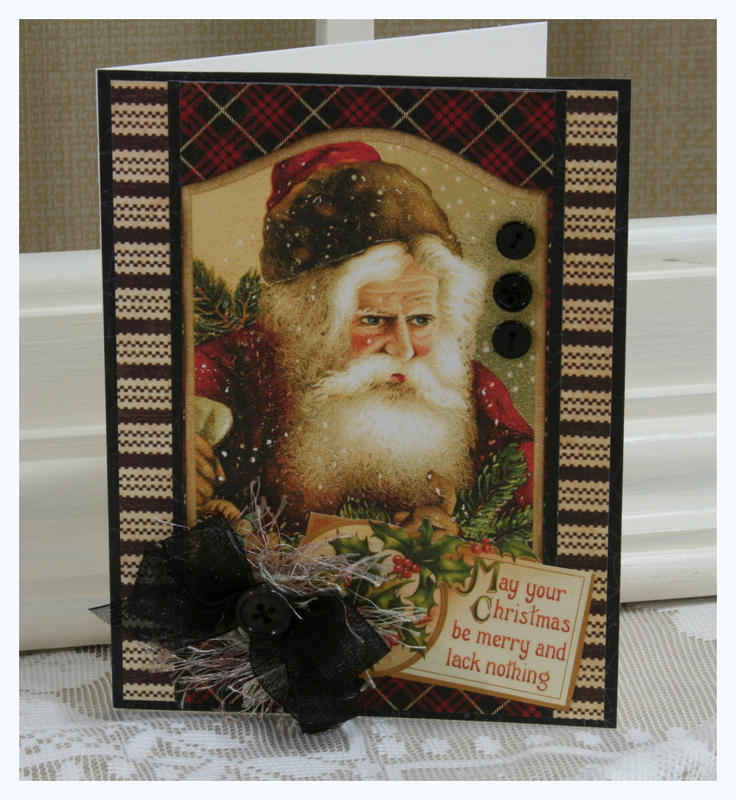 The paper I choose for this card is from Paper Loft. The small button card is from Crate. This lovely little bloom is separate flowers cut from the same sheet of scrap Graphic 45 paper…this time I did dry brush it just a bit to bring the intensity of the color down. 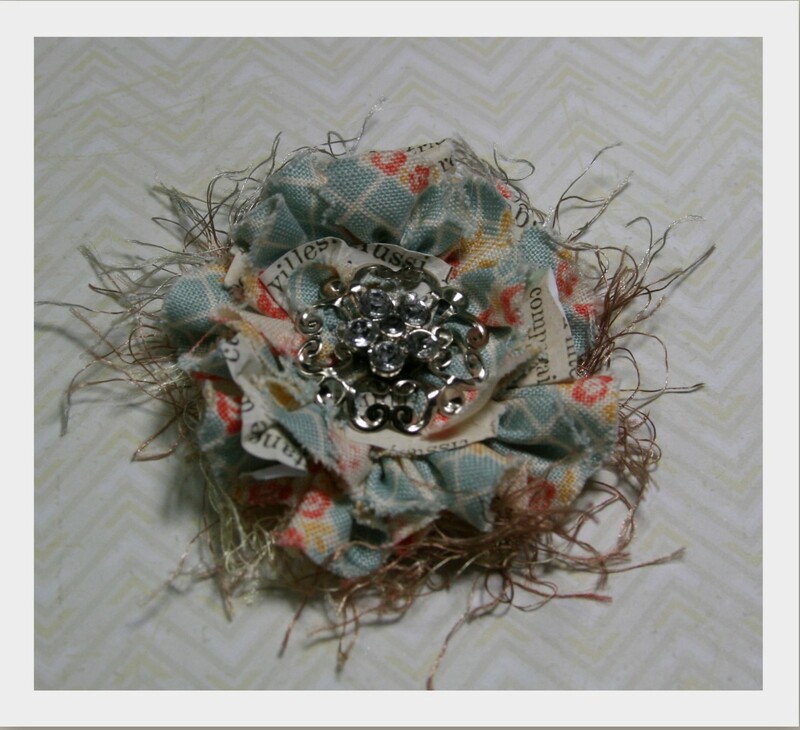 I layered and curled several flowers and gave it a pearly accent center. Just my luck…I found a small scrap of paper that looks just like burlap! It looks like it has a lot of texture. 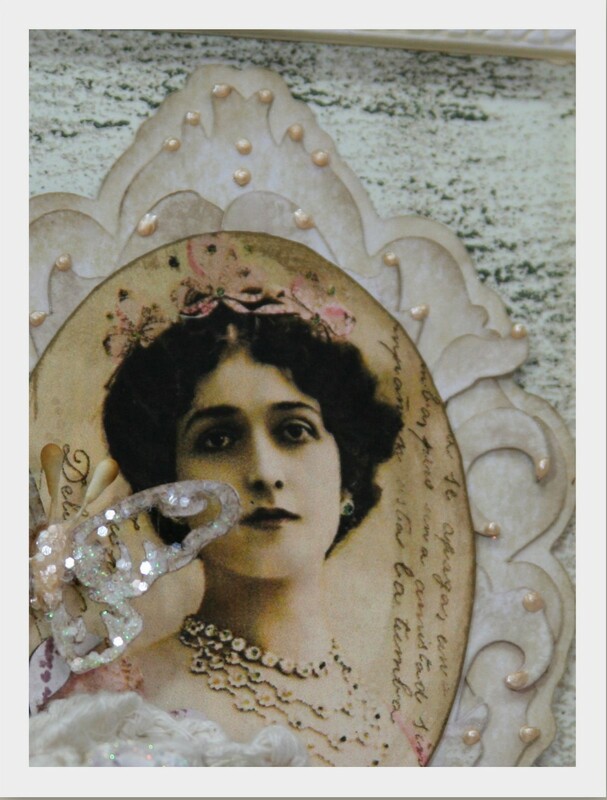 I used it to make a sweet little banner and topped it off with a string of pearls. 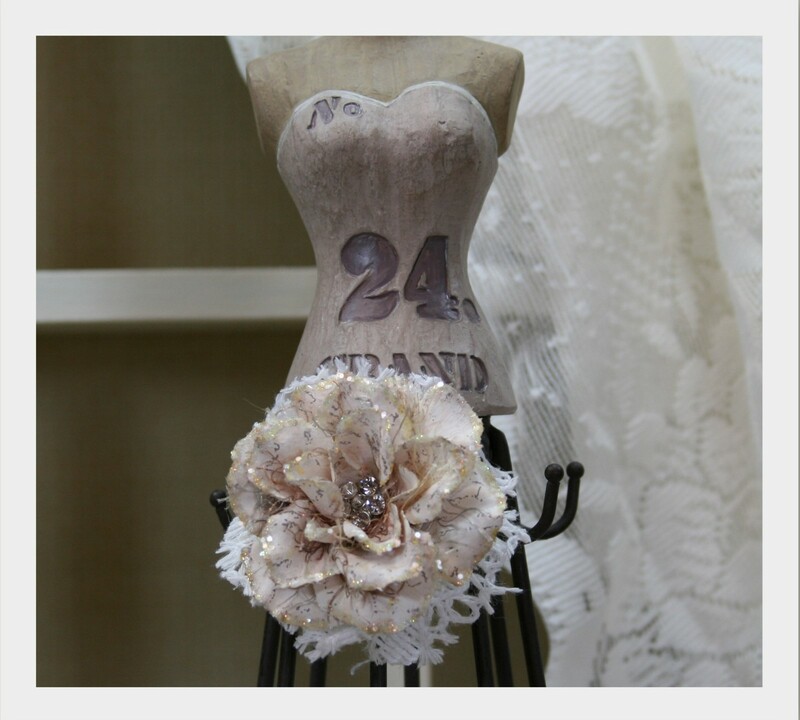 A creamy ribbon and bow are the final accents. 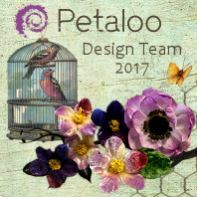 I’m very excited to be auditioning to be a Design Team Member for Graphic 45. I’ve had myself a good old time creating these new projects just for this audition. 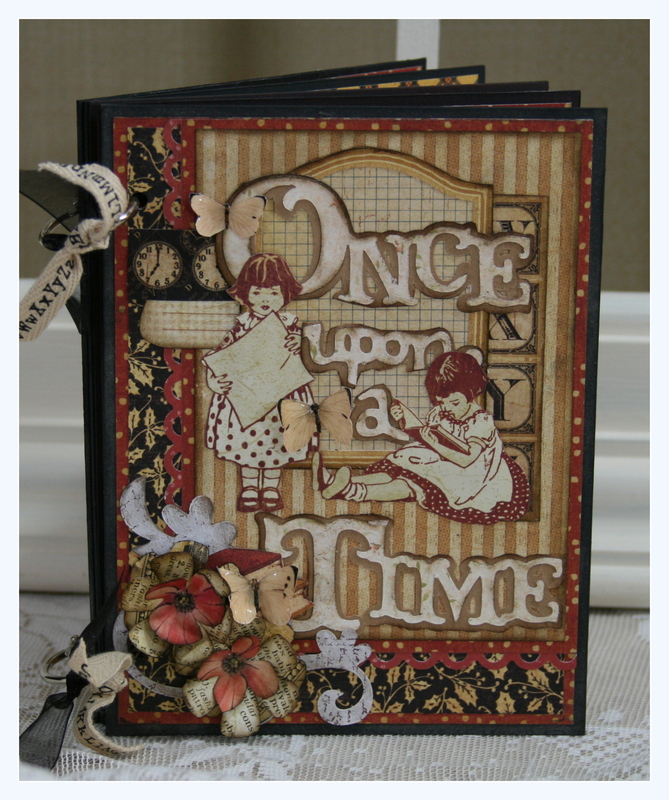 There’s quite a few pictures….so get yourself a cup of coffee and set a spell and check out these great creations using fabulous Graphic 45 papers. 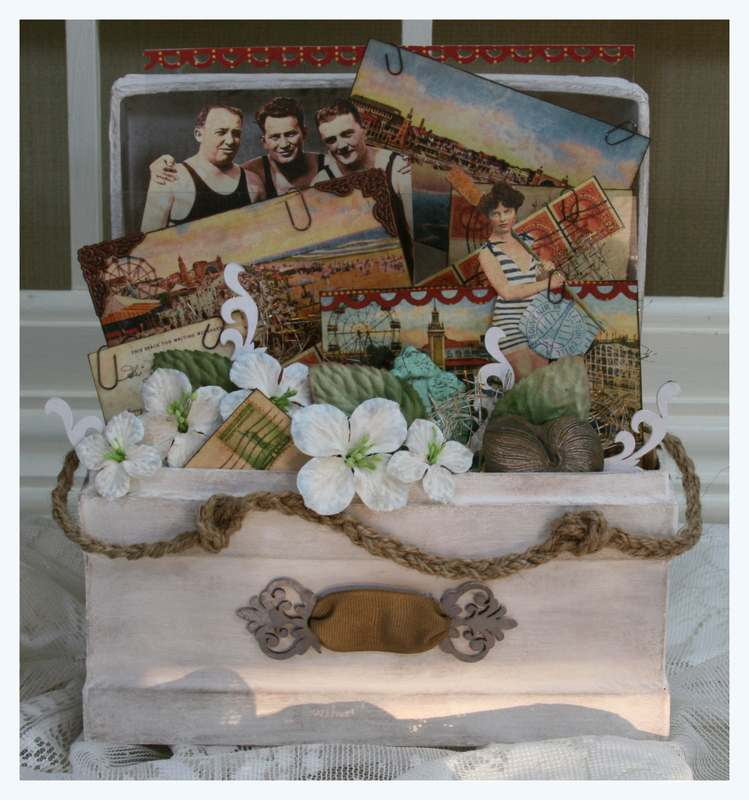 This vacation memories chest has ton’s of layers of vintage images mounted on acrylic sheets with tiny clips. 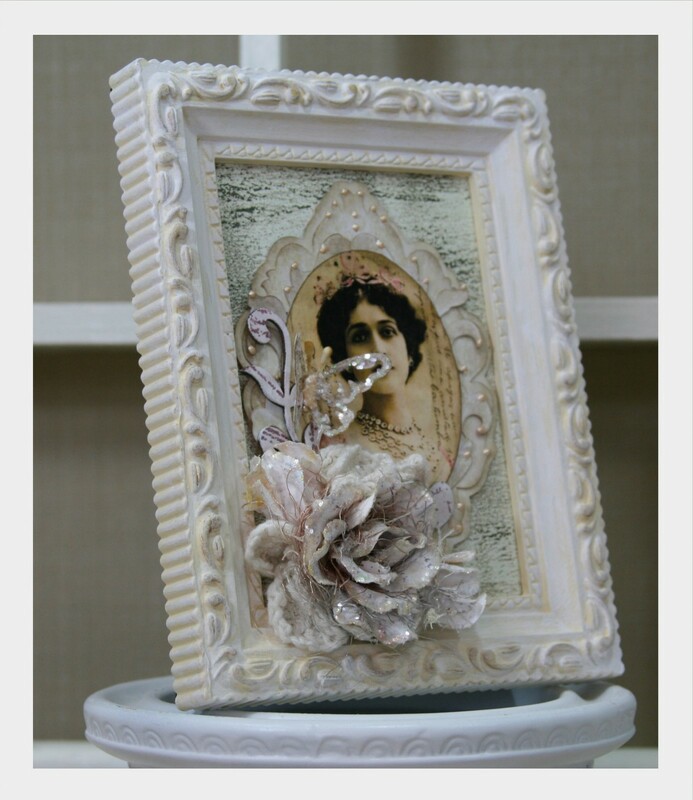 I started this project out with paper mache and finished it off with my usual shabby chic style. 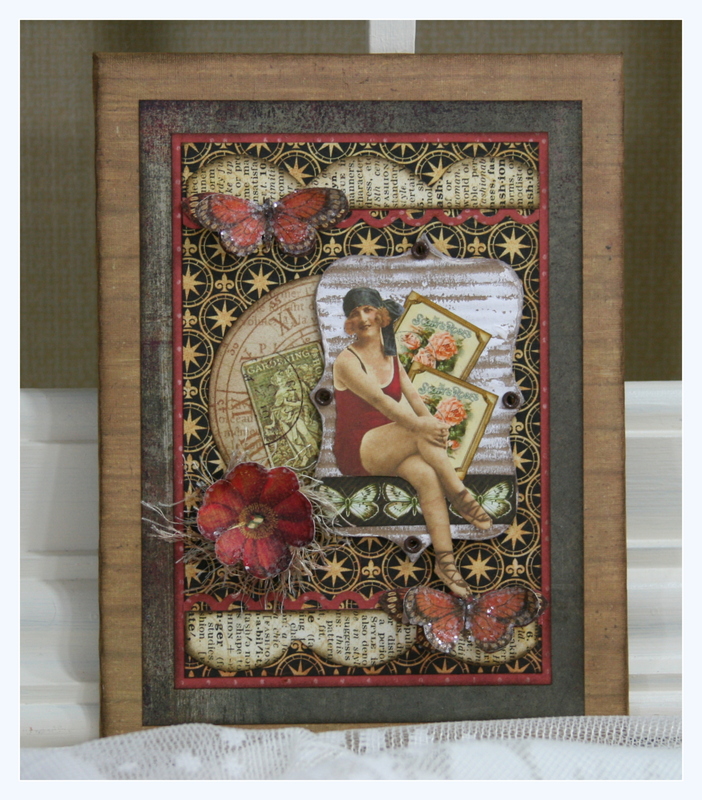 I embellished with flowers, shells, and Dusty attic chipboard. 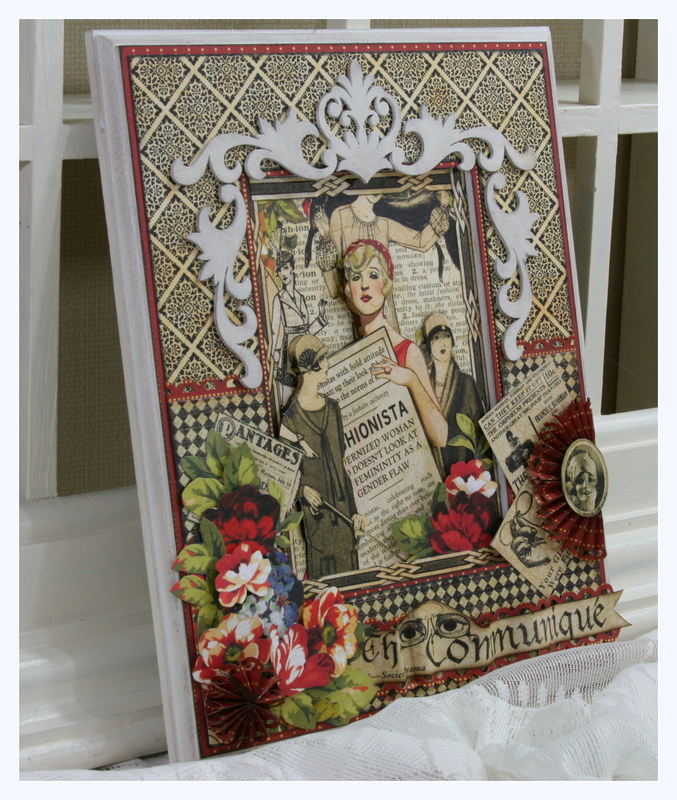 Fashionista Frame with lot’s of paper pieced layers for detail and depth. 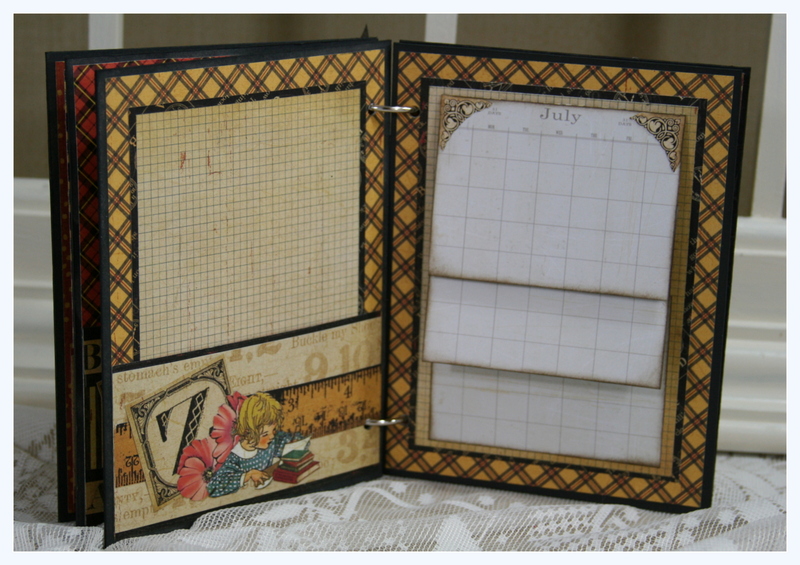 Each set of pages has 3 month cards that flip up and a large pocket on the left to tuck in memorabilia and pictures. 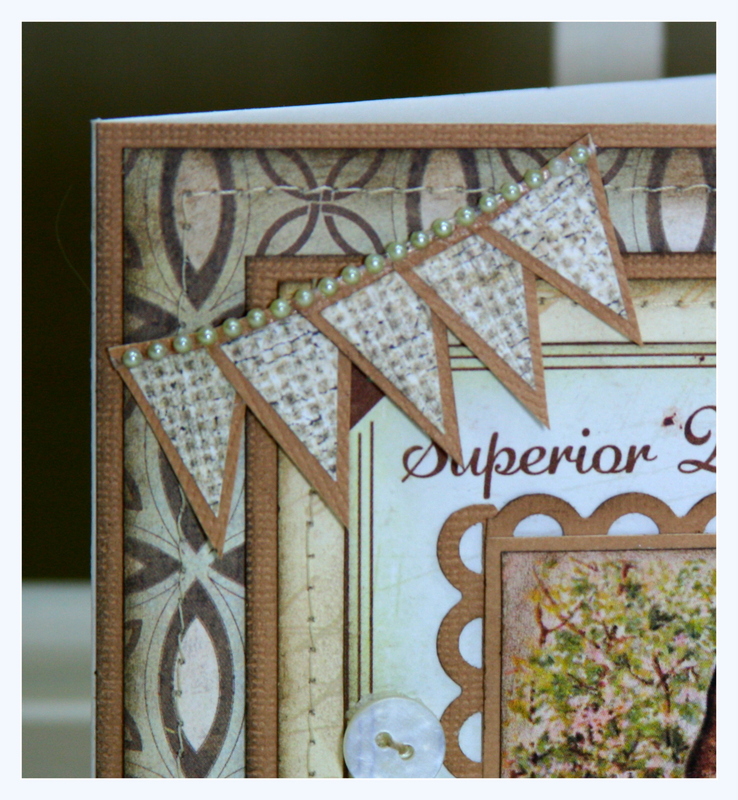 Loving the embellishments in the corner! 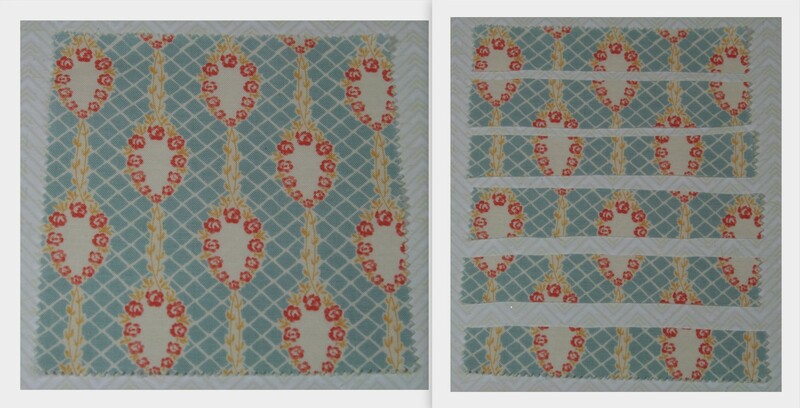 Layout for my Niece and her daughter : ) They are very outdoorsy so no girly frou frou! 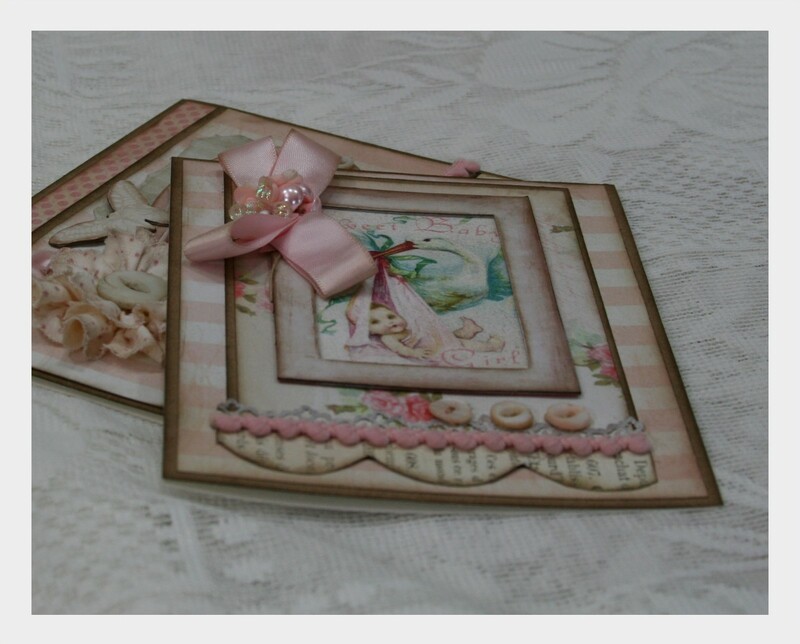 Shabby chic and very vintage wedding card. Very traditionally styled Christmas Card. I’ve been hoarding this image for quite a while waiting for a special occasion. This project is very special to me as it was my “personal challenge” for this post. 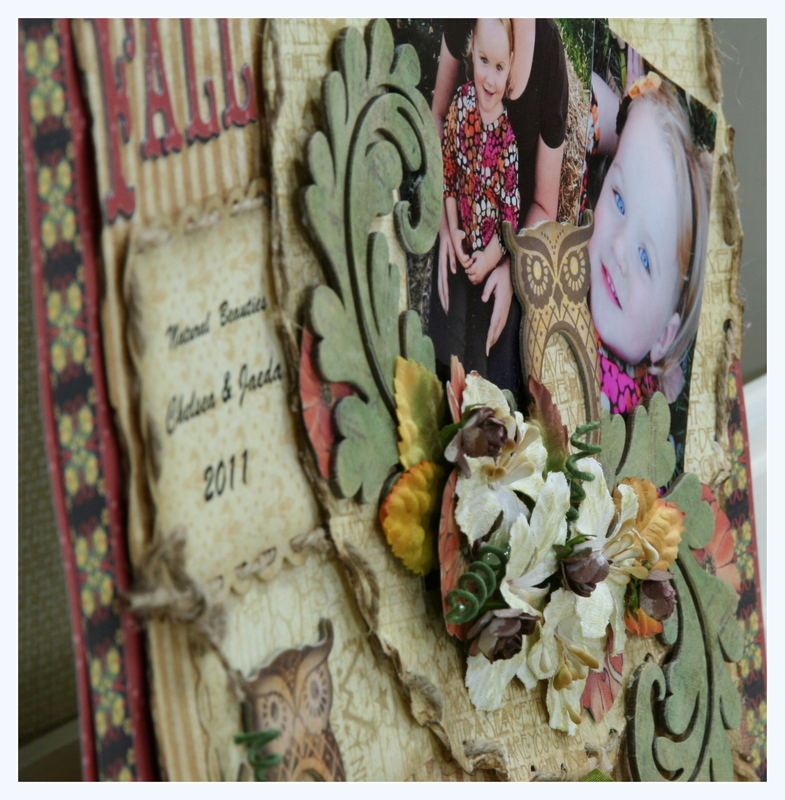 Make a collage with only items from the scrap and salvage box. All these yummy little bits and pieces were leftover from other projects just waiting to have a home of their own. Okay that‘s it from my audition projects. I want to thank everyone at Graphic 45 for the opportunity to be considered to join the team and for making such beautiful papers for us to play with. Best of luck to everyone who tries out….it takes a lot of courage….but we did it!! !YAYYY US!!!!! The beautiful vintage image came from Graphics Fairy : ) I wish I could have used the whole image…but that would involve painting another frame lol. 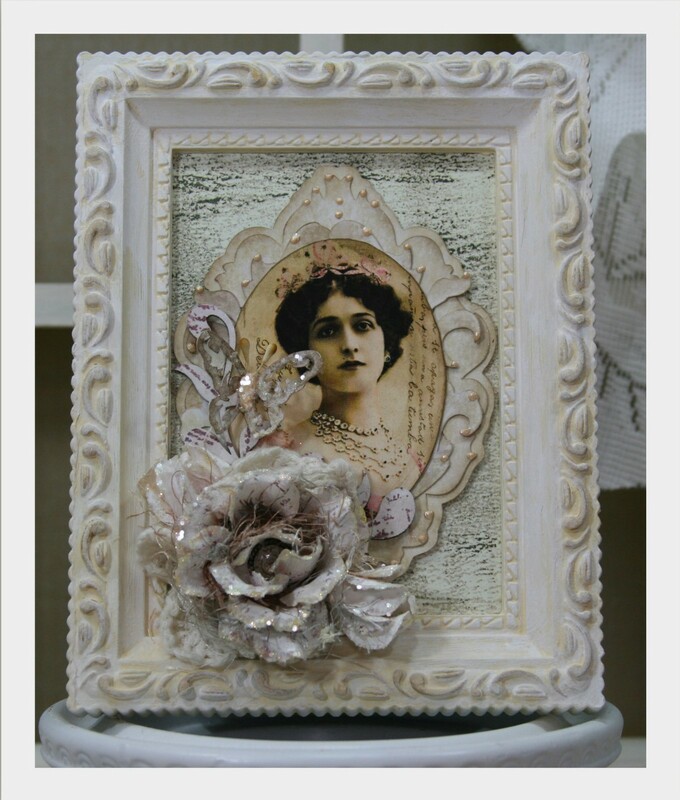 The faux frame layered behind the pretty lady is made from several pieces cut with the Cricut with white cardstock. The cartridge is Sentimental. 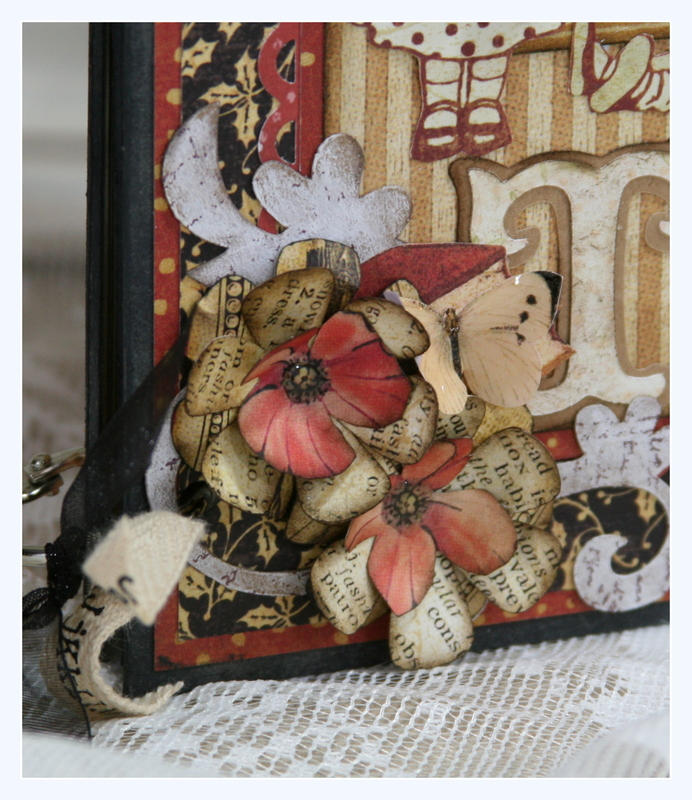 I used different Tim Holtz Distress inks to mottle the colors and inked the edges as well. Then each layer got a misting of Perfect Pearls Mists in Biscotti. While it was still wet I sprinkled on a generous amount of flocking powder. To finish off the details I added Perfect Pearls also in Biscotti. I removed the glass from the frame so as to have enough space for lot’s of dimension. 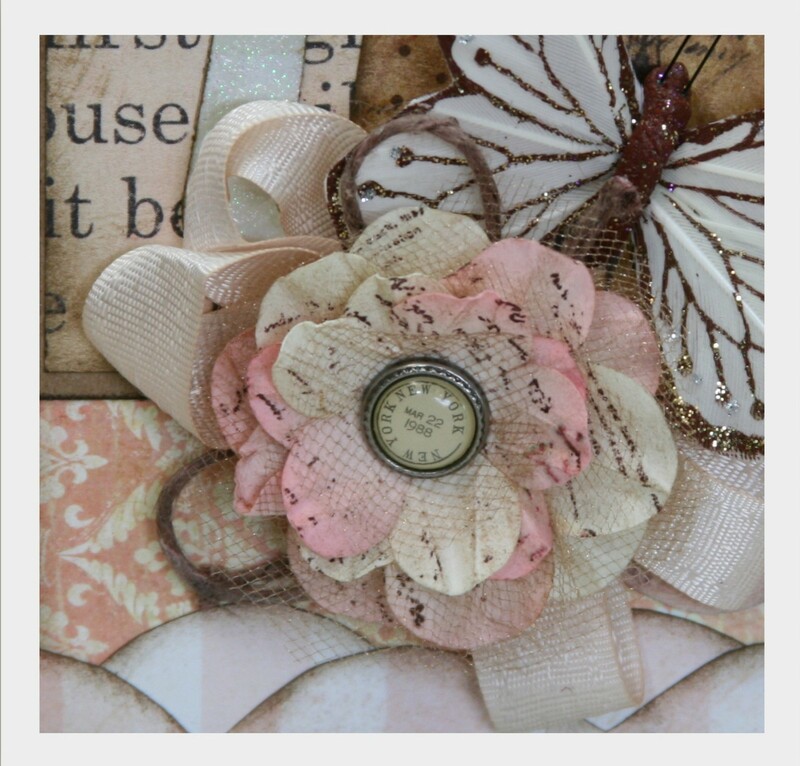 There’s a chipboard leaf embellishment from Dusty Attic and a sweet glittery butterfly. It also keeps the glare off of it should I be lucky enough to be enjoying lot’s of sunshine in our new location. I really wanted to find the cord to the sewing machine. 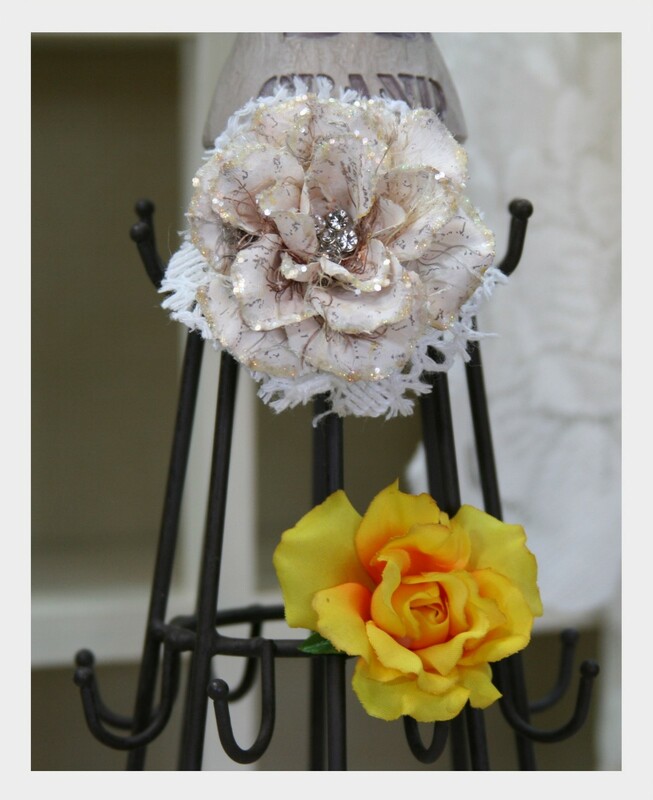 Thank you Stella for displaying my flower with shabby chic style : ) I can’t even begin to tell you how many steps it took to get to this point lol. I love it so much that I sewed on a pin back so I can wear it to dress up a sweater or tank top…or even a purse???? No I am not playing a trick on you…this was the same flower!!! Not to say that yellow roses aren’t nice and all. LOL I like the after a whole lot better : ) And are you noticing that there are two flowers??? You guessed it…I will be giving this one a makeover too! So I also finished a couple of cards to share with you. Awwww. I love this vintage image from Graphics Fairy. She is too sweet. Makes me wish I had a little girl. Or a bunny. Yeah I”ll take the bunny instead. New favorite flower for a card. 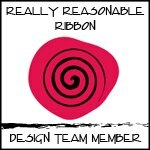 I found this ribbon while looking for that darn cord. Very easy and stitched up super quick. 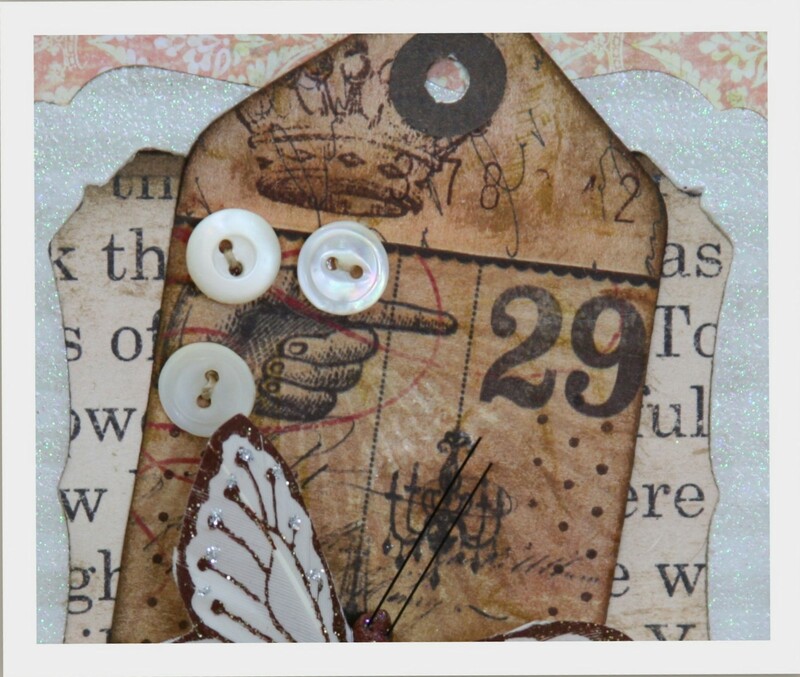 I think I was channeling my inner Tim Holtz with all the ink on this card. 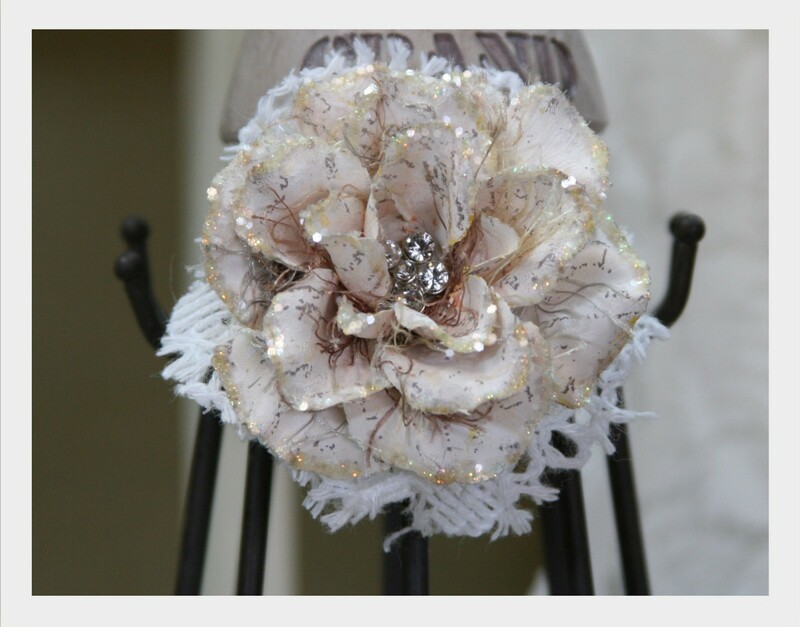 This was a purchased flower that I pulled apart and stamped, then added gold netting and a beautiful brad center. There’s a bit of twine looped in the back also for extra detail. There’s like 5 different Distress Ink colors there haha. Once I got started it was hard to stop. I tucked this tag made with papers from My Minds Eye behind a glittery frame and layered it on a strip of typography from Jenni Bowlin Mercantile. But….I did not find the cord to my sewing machine. Dang. Guess I’ll look again tomorrow. I might even find some more treasures to create with for my next post. After requests from new friend Margie I created a tutorial to make flowers like the ones I have been using on my projects. They are really very simple and quick to make. The fabric I used came from the local quilt shop owned by my friend Jennifer. 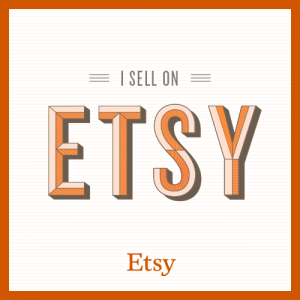 They sell bundles of coordinating patterns that are 5″ squares. Each square is enough to make 1 flower. I chose this pretty blue pattern. Start by cutting the square into 6 strips. No need to be super accurate here…neatness doesn’t count. Next cut 1 side of each strip with a scalloped edge. Good sharp fabric scissors are essential!!! The scallops do not need to be even….but they should be deep enough to emulate a flower petal. Begin a straight running stitch being very careful not to backtrack your stitches otherwise the fabric will not gather when you pull the thread. Stitch through each section on the same thread until you have all the sections sewn into one long ruffle. Use care not to gather them too tightly otherwise they may not lay properly in the finished flower shape. 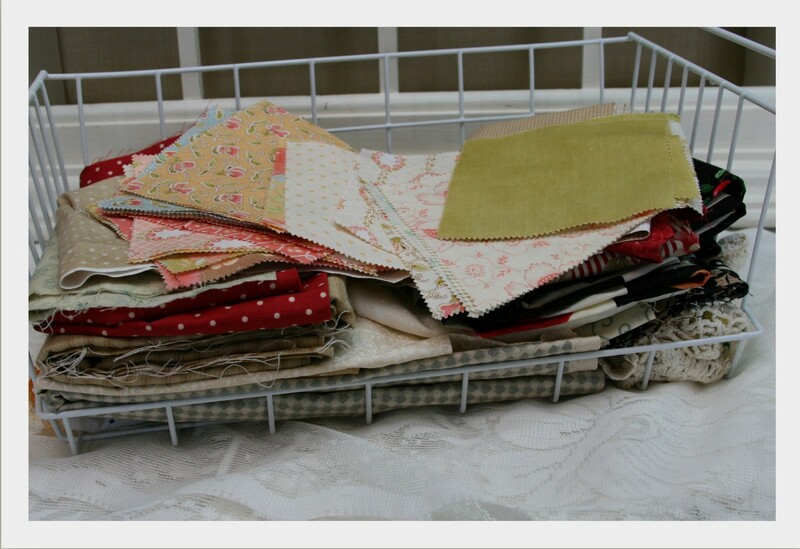 Once again…the fabric will not gather if you backtrack your stitches. 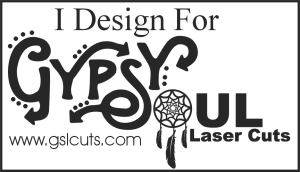 Cut a small circle shape from heavy cardstock or file folder. Apply a generous amount of Tacky glue to the center of the circle and begin forming the outer edge of your flower taking care to keep the ruffled edge on the outside of the circle. Continue wrapping the center in and press into the glue. There is plenty of time while the glue is wet to get the desired shape and size. You can pull it off and start over if you need to…but be careful not to get glue on the outside of the petals. 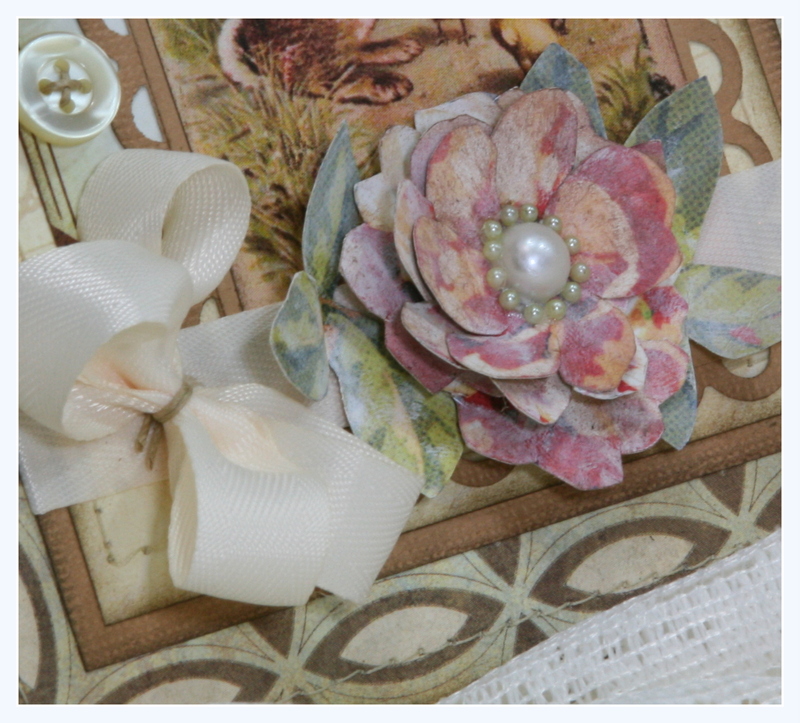 Use a pretty brad or button for the center…or better yet find an old piece of costume jewelery for a true vintage look. Once the glue is set you can easily pull off the tiny threads from the petals using a tweezer. 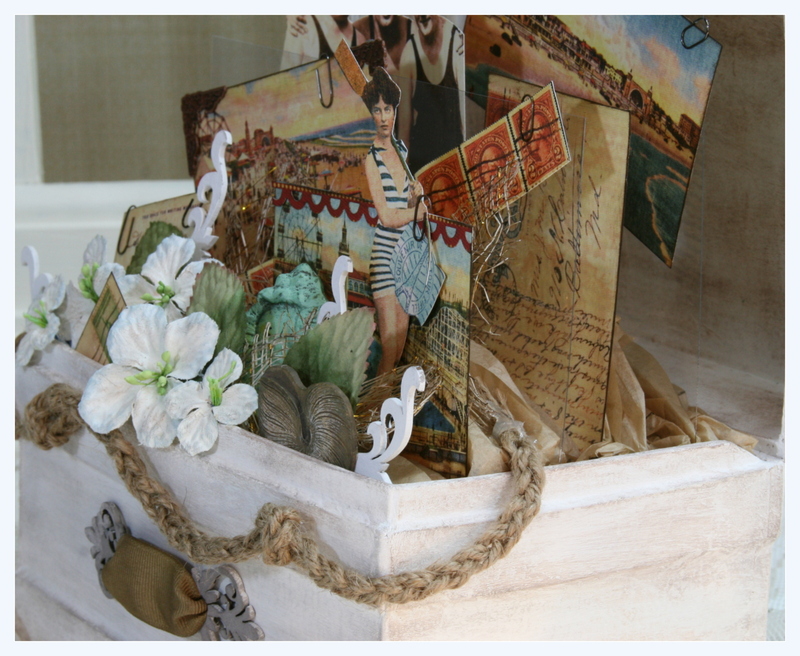 If you wish to leave them as I did…it gives a more textural and handcrafted look. 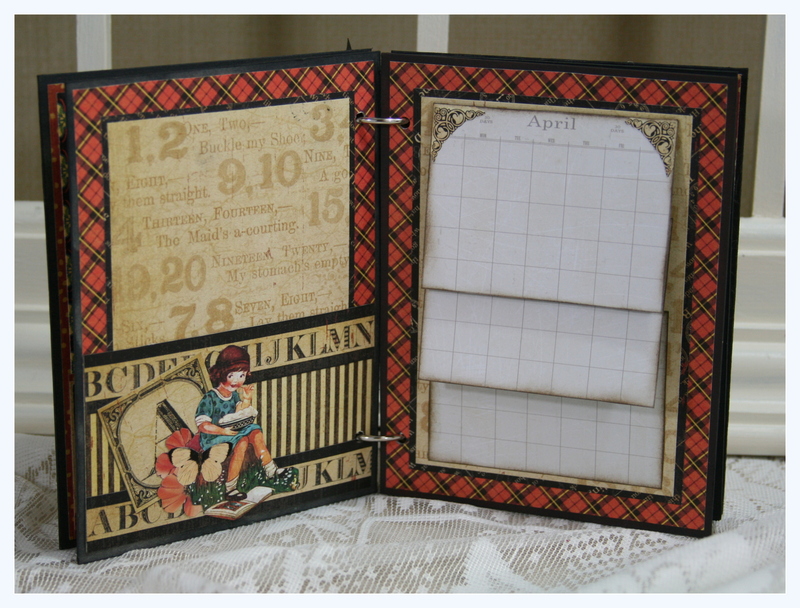 This looks really lovely just like this or you can add fibers and bits of sheet music or typography. 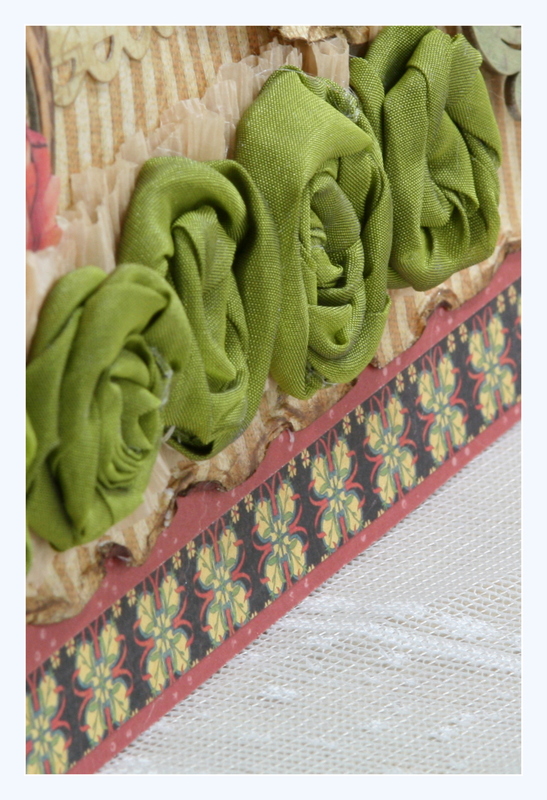 I’ve also used lace trim and ribbon leaves. 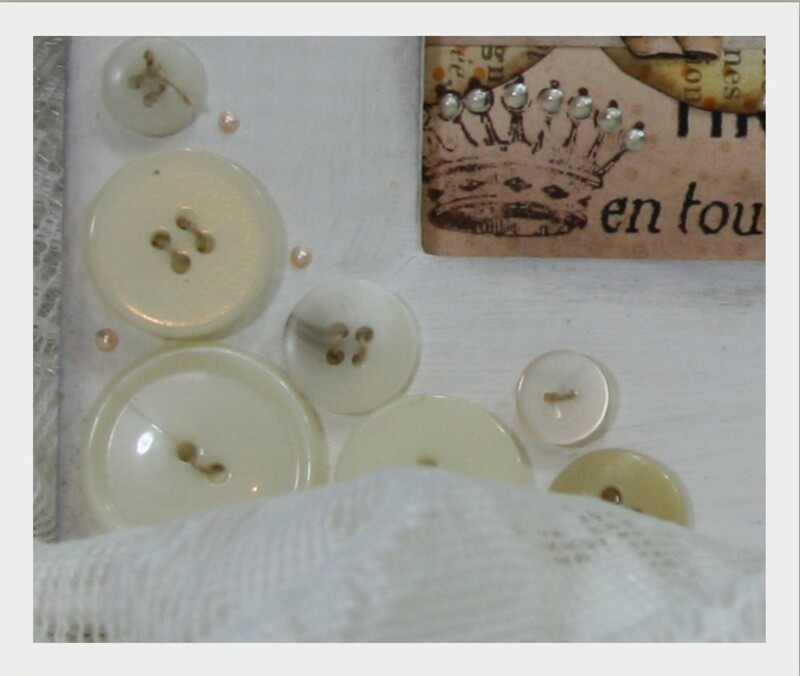 Pearls or beads or buttons would also make a pretty center. Here is one more look at the finished flower. Guess I better come up with a blue project tomorrow so I can use it. 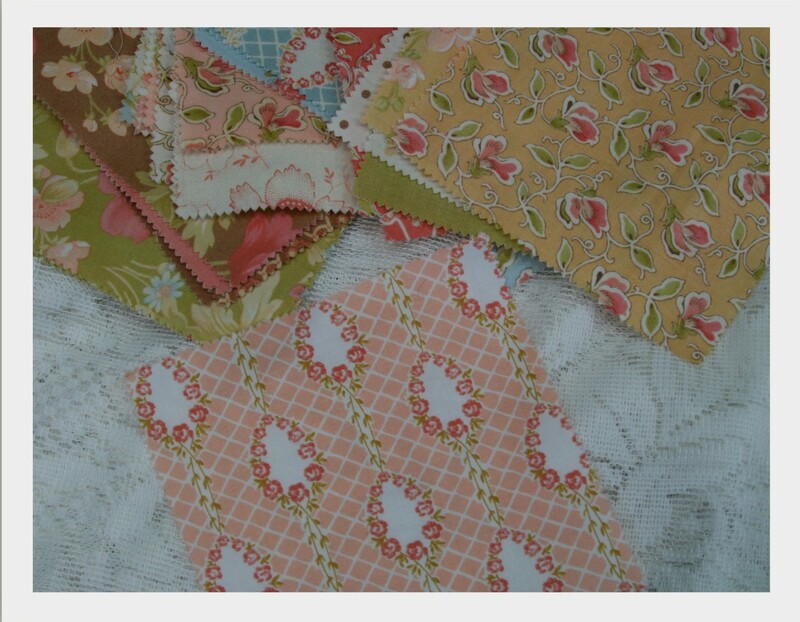 Here is a look at my lovely fabric selection to make flowers with. 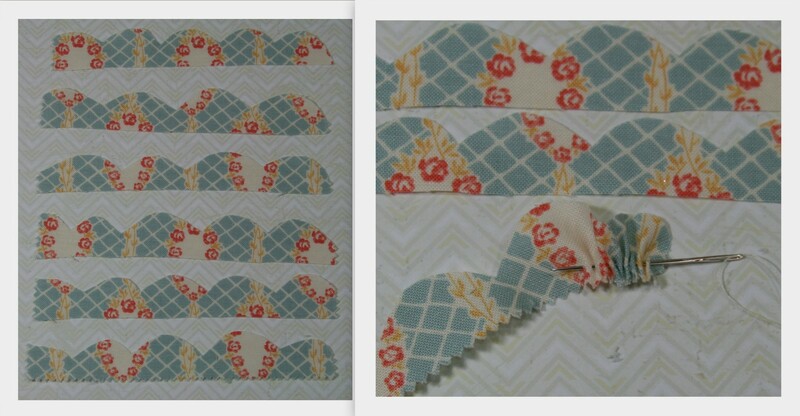 You could easily adapt this basic tutorial to your own tastes simply by cutting a different scallop shape, or using additional fabric. In a previous post I shared a flower that was solid creme colored fabric that I stamped a polka dot pattern on then inked it….so you can customize these flowers very easily. Use these flowers for any paper or crafting project like cards, scrapbooking, tags, banners, headbands. If you do use them on cards…beware that there is extra postage for shipping. 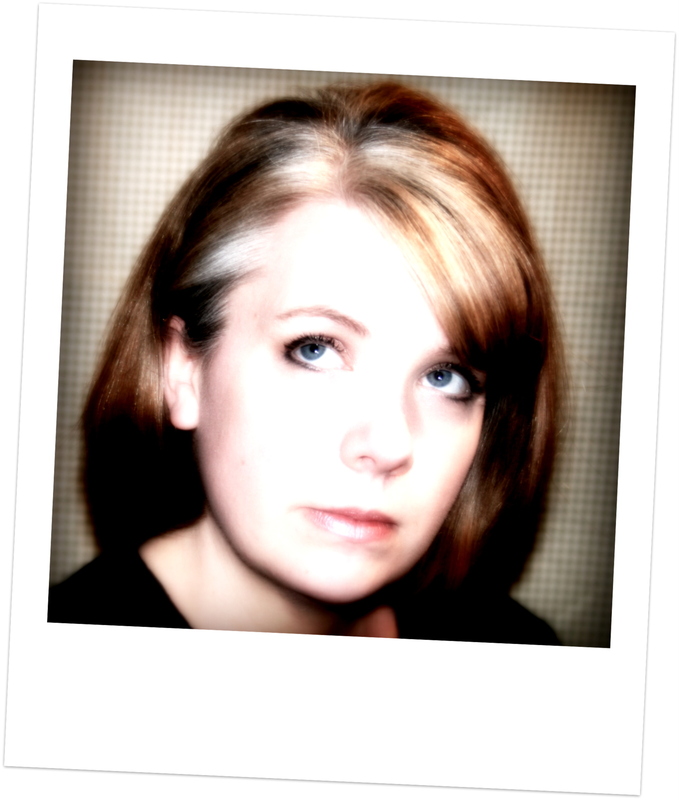 Okay Margie….there is your tutorial : ) Hope it helps! Email me some pics of your flowers when you start making them…I would love to see your creativity and how you use them on your projects. 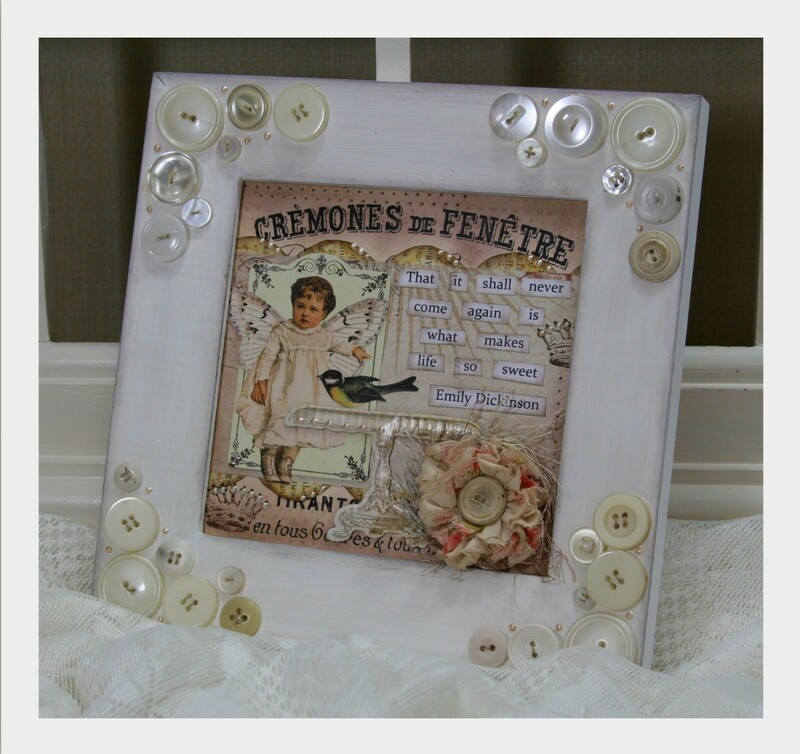 This sweet little wall decor is heading for the shop. 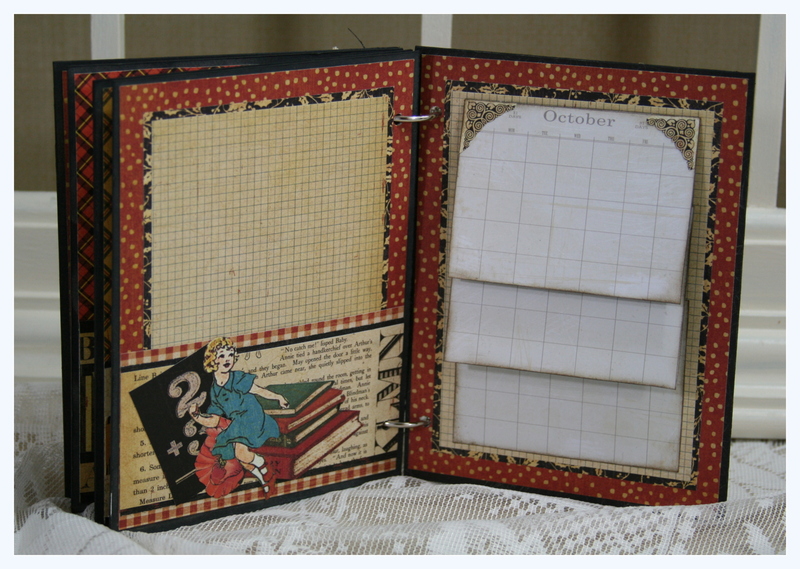 I used many lovely vintage images from Graphics Fairy and layered them with papers from My Mind’s Eye. 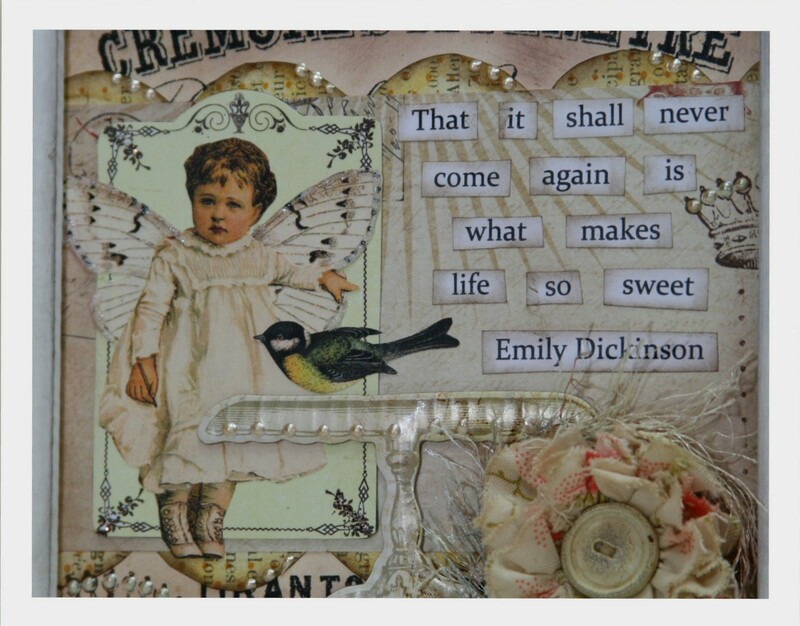 A beautiful quote from Emily Dickinson was the perfect sentiment to add. 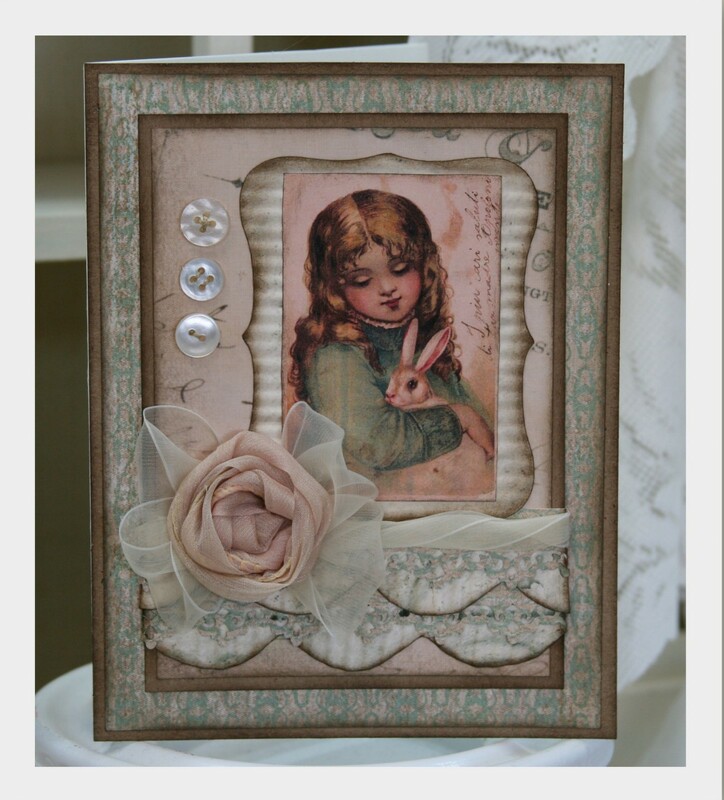 This charming little girl image is one of my favorites from G.F. I clipped her from her background to keep the colors shabby chic. I stamped a bit with chocolate ink from Stampin Up and did lot’s of Distress Inking also for instant age. The awesome little chipboard table is from Pink Paislee. The perfect place to perch a little birdie image from G.F. 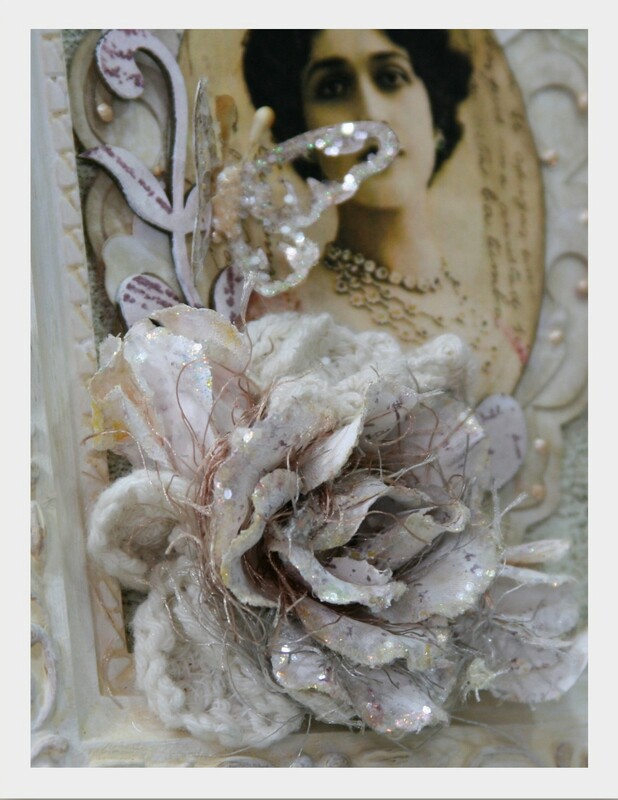 There are Liquid Pearl accents from Tim Holtz for detail. If you get your buttons from a vintage antiques market like I do…you know that the bags usually have several larger buttons in them that just don’t seem to look right on cards. 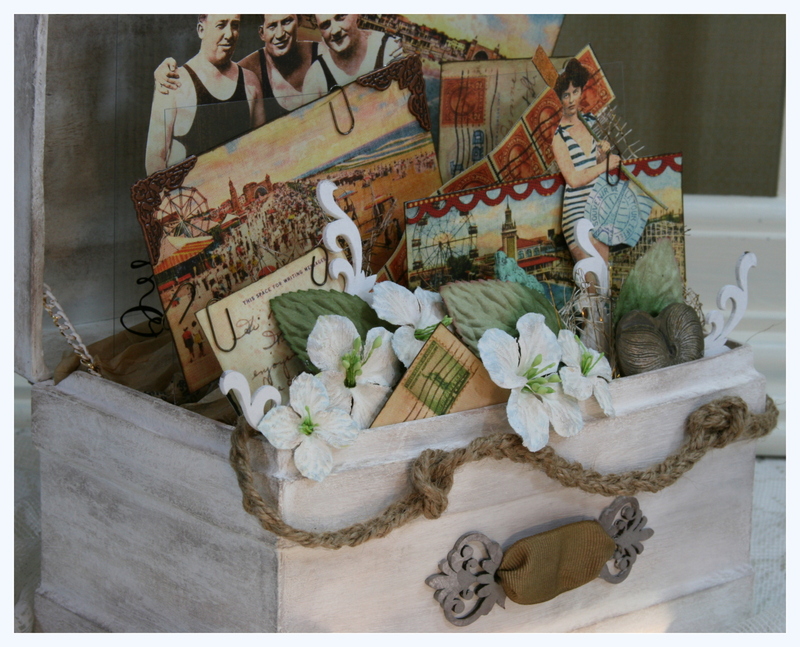 This was a great way to use many of them to give subtle detail to a simple painted and inked wooden frame. Yes I know I’ve gotten a bit crazy over these fabric flowers….but I am blaming my friend Jennifer who owns our local quilting shop for selling me too much beautiful vintage fabric. I gotta use it right??? LOL. This particular flower was tea stained for additional patina. Natural fibers finish it off perfectly. Can’t wait to decorate my shop with this sweet framed collage. It’s getting closer to our Grand Reopening yay!!!! I have 2 sweet cards to share today. Very pink and girly and just right for a new baby. 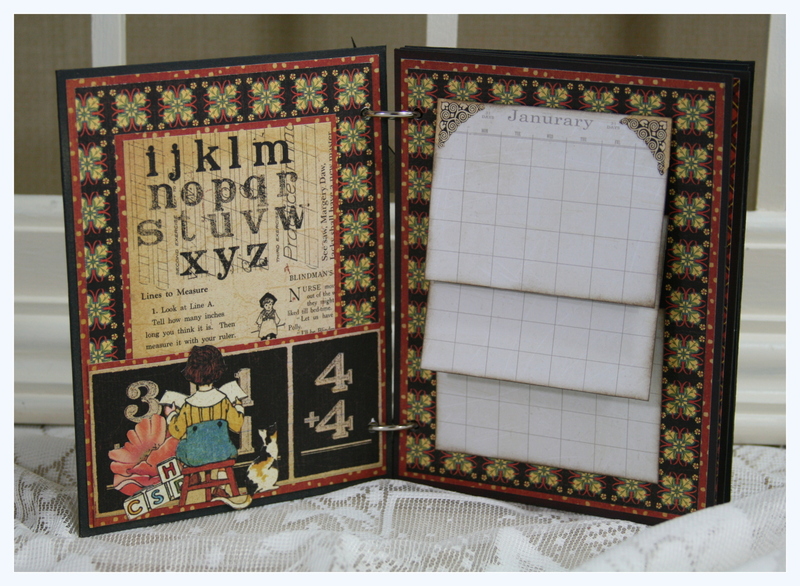 I used My Mind’s Eye papers with craft paper borders. 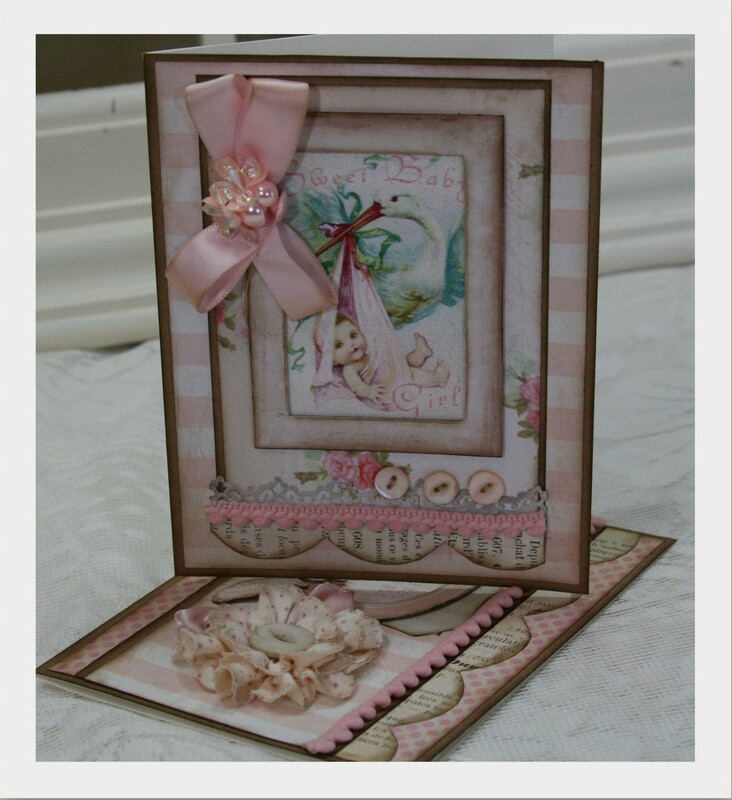 Loads of chipboard and pretty scalloped edges. 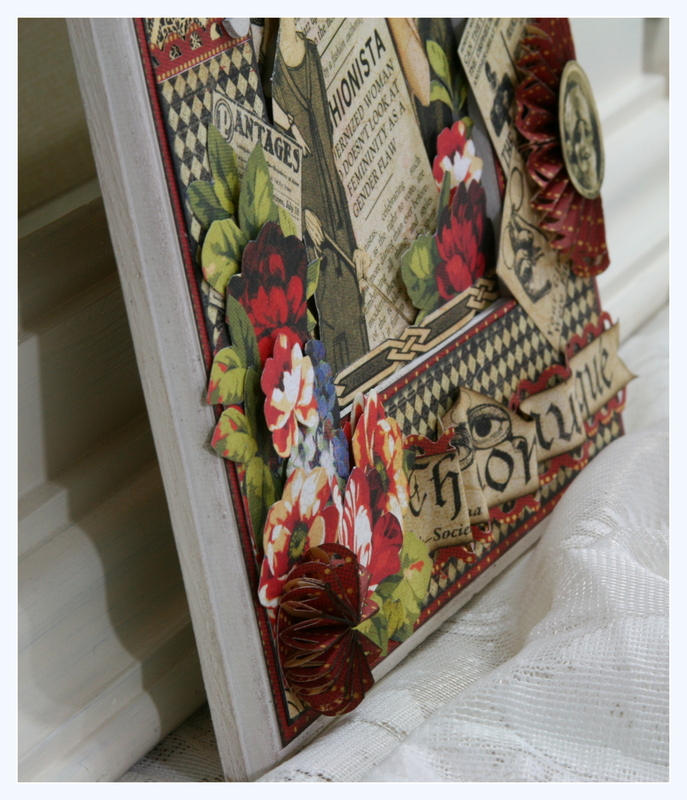 The image is from Crafty Secrets…it’s actually canvas so it has a nice texture. I inked all the edges to define the layers. Walnut Distress Ink from Tim Holtz. I added some pom pom trim for added detail. The buttons are real vintage from or almost local antiques market. 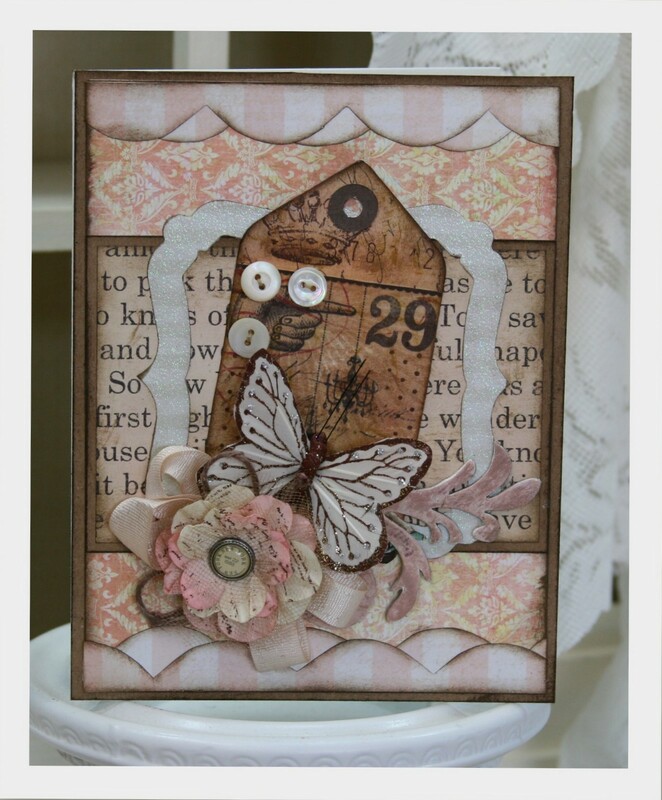 The butterfly chipboard is from Pink Paislee. To make this pretty ruffly flower I started with creamy colored fabric…then stamped on the polka dot pattern and inked the edges. 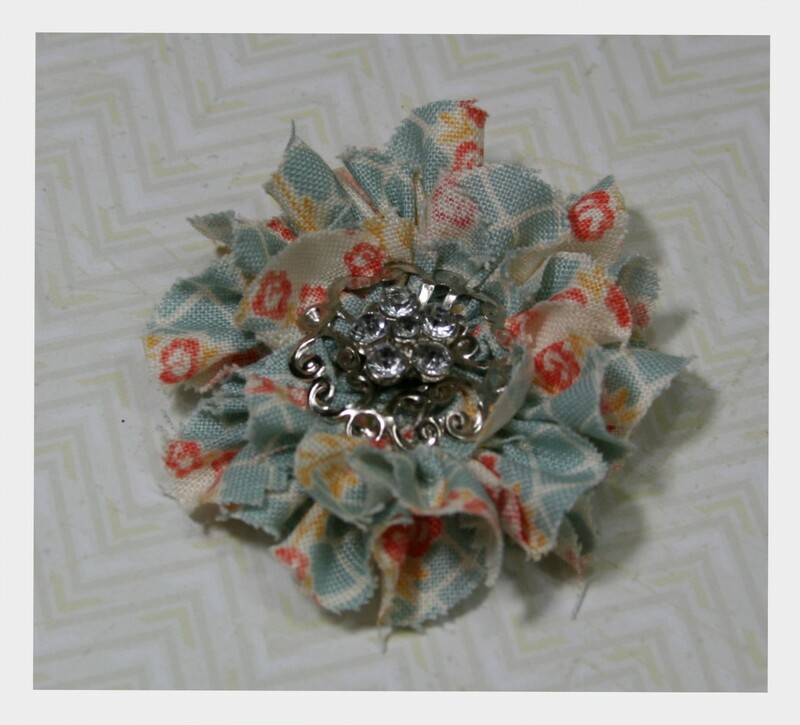 Finished off simply with a large button and ribbon leaves. 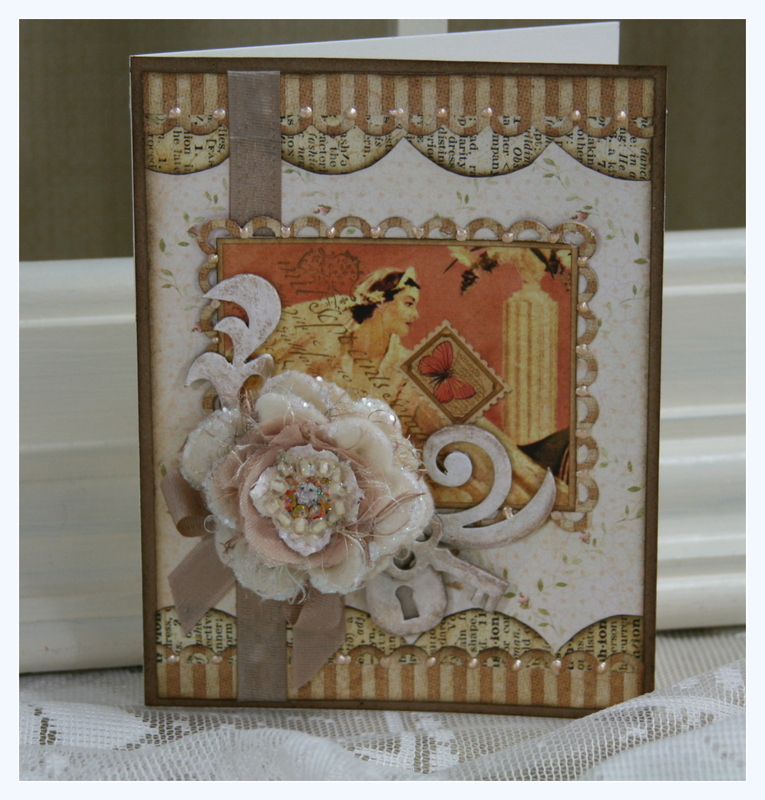 I’m thrilled with how these turned out with their soft colors and vintage images. 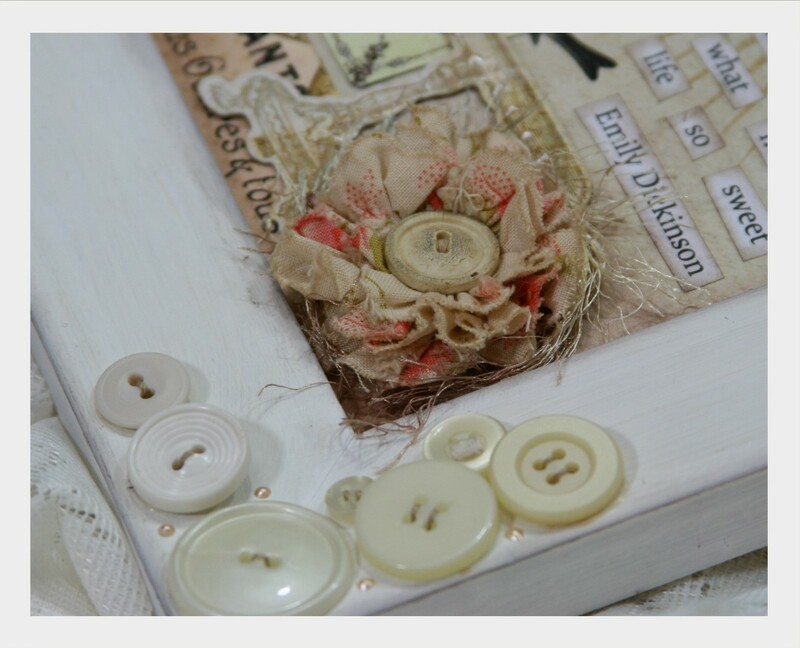 Adding the chipboard elements gives them lot’s of dimension.